If you came across Well Investments LTD sales video and is considering to use their Automated Asset Manager, please stop and read this first. Wells Investments LTD is a scam, and so is their Automated Assets Manager (A.A.M). Read our in-depth Well Investments LTD scam review to find out the truth. You will most likely come across Wells Investments LTD sales page through a shady email that promises you automated profits, or an unsolicited pop-up that appears while you are surfing the net. The alleged owner of Wells Investments LTD scam, Nicholas Wells promotes their automated trading software called the Automated Asset Manager and claims that it can perform extremely fast trades to bring you profits. It’s a guaranteed way to win huge profits based on the large amount of winning trades the software will generate for you. You were guaranteed up to $879.26 profits per hour, but this is just a fake promise to get you hooked and fall prey to the scam. We’ll reveal a conclusive evidence at the end of this review to prove that none of the guarantees given in their sales material is real. Before that, let’s look at some red flags in Wells Investments scam that you should take note of, and shun away from future scams that exhibit the same warning signs. Right below the sales video found at the homepage of Wells Investments LTD scam, you’ll find a tickling countdown timer and a number of member testimonials that claim to have made huge profits with their Automated Asset Manager software. Let’s talk about the countdown timer first. You are led to believe that there are only 25 spots in total, and your spot is only reserved for 10 minutes or so. Is there really limited spots to Automated Asset Manager software? There’s one easy way to find out if the countdown timer is fake. You can copy the URL of Wells Investments sales page and load the same page in a different browser. You’ll realize that the timer will be reset, and your spot will still be available. The timer is just a computer script that is set to start counting down every time the homepage is loaded in a browser. Or if you let the timer depletes itself, you’ll realize that you can still sign up for a broker account just fine. There is no limited spots to begin with, and the timer is there to create a false sense of urgency and limited time offer. By placing the counter and timer, Wells Investments LTD scam can force a few more impulse sign ups. Right below the timer there are a number of rotating member profiles and testimonials that seem to add credibility to Wells Investments LTD and their Automated Asset Manger software. To verify the authenticity of these profiles, I did a reverse search of their images and found that none of these members is real. Take a look at the member displayed in the screenshot above. His name is Steve Gallagher, and he claims to have earned more than enough for a luxury Hawaii trip within 12 hours of joining Wells Investments LTD. However, the real identity behind this photo is actually Kameron George, and his picture was stolen from Instagram by the scammers to promote Wells Investments scam. The same goes for the rest of the members featured in the scam. 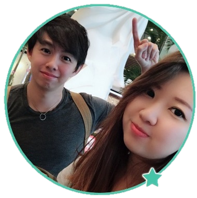 The pictures are all stolen from the internet, and these people are not related to the scam at all. Even though the scam is putting up a 100% income guaranteed and zero experience needed guarantee, Wells Investments scam is denying all of that in their own disclaimer. You won’t find the disclaimer in any part of the sales material, because it’s supposed to be hidden. You can only find a link to the document through a very small fine print at the bottom of their sales page that reads “risk disclaimer”. 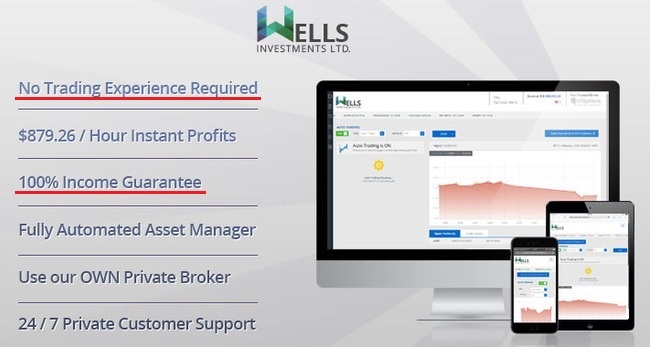 Due to the high risk of nature of trading, ‘Wells Investments Ltd” explicitly does not make any express or implied warranties or guarantees that users will make any profit or that users will not lose any or ALL deposited investment funds. Trading in binary options is very speculative and high risky… only for those investors who… are financially able to assume the loss of their entire investment. Self explanatory – Contrary to what they promise in the sales materials, Wells Investments LTD scam does not guarantee you any profit. Not only that, you will most likely end up losing ALL your deposited investment funds. Again, Wells Investments LTD scam admits that trading binary options is extremely risky, and it is only for investors who can stomach the loss of their entire investments. It’s very obvious that the scammers behind Wells Investments LTD scam are trying to escape from the blatant lies and fake promises they have given you in the sales materials. Compare what you’ve been promised in the sales material against their disclaimer, and realize how the scammers are trying to deceive you. The sole purpose of this disclaimer is to protect those scammers from legal complications when you finally lose all your investments using the software. You cannot take any legal actions, because it’s already stated in the disclaimer that Wells Investments LTD doesn’t make any guarantee to you. If they are investigated, regulatory is going to look into their disclaimer (official legal document), not what they claim in the sales materials. Unfortunately, it’s the users’ own responsibility if they lose money with the software despite the warnings stated in the disclaimer. Is Wells Investments a Scam? YES, WELLS INVESTMENTS IS A SCAM. We strongly advise you to stay away from the scam if you don’t want to lose your hard-earned money. DeepNet Trading Scam Review – Don’t Invest into It! The Amissio Formula Scam Review – Stay Away!